Searching for top notch content from the top bloggers? The 9rules Network has recently announced “Introducing 9rules Search: Member Content Plus A Whole Lot More”, their new 9Rules Network search engine service. You can search the entire network or use the category specific searching on each blog category to narrow your search. They use Ajax to speed up page loading and a few other neat bells and whistles. 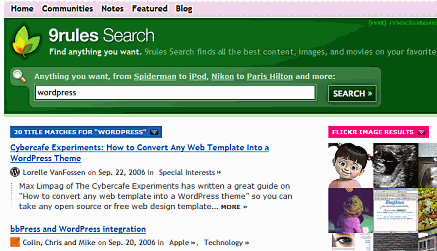 And if they don’t have enough content within your search, they invite you to search for more on Technorati. The search page design is lovely, concentrating the information on the search results. Other networks and blog communities could take serious lessons from their efforts to create a distinctive and powerful group only search service. It’s still new and I found that it still has a few bugs in generating search specific results, but it is a fabulous start. Well done, and congrats, 9Rules. This entry was written by Lorelle VanFossen and posted on September 28, 2006 at 1:49 am and filed under Blog Babble, Blogging, Web Wise. Bookmark the permalink. Follow any comments here with the RSS feed for this post. Post a comment or leave a trackback: Trackback URL. Wow, Mike! I don’t know if I’d let too many people know that. 😉 Actually it speaks well of 9Rules members as they don’t quit and will challenge anything, even if they have to learn by the seat of their pants. Makes be proud to be a member. The little bugs are just a way of life. You learn and fix and fix and learn and that’s how it all works. It’s really slick and I honestly think the new search sets an awesome example of how a search should work. I’d love to see something similar here with WordPress.com.